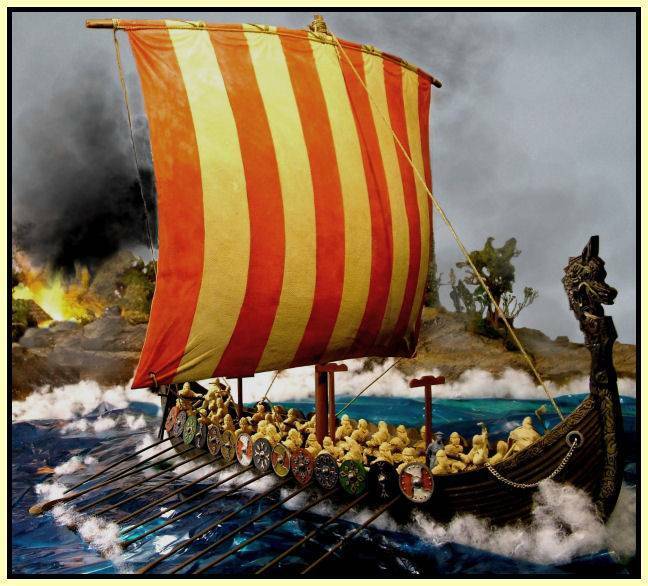 1.The Anglo-Saxons invaded Britain in the 5th and 6th Centuries. They game from Denmark and Germany. 2.They first came to fight for the Britons but stayed on and conquered a land they evnetually called England. 3. The Anglo-Saxons became the English and their language was English. 4.The Anglo-Saxons were conquered by the Normans after the battle of Hastings in 1066. The name Anglo-Saxon comes from two of the tribes who invaded Britain - The Angles and the Saxons. From AD 70 until around AD 400 to 416 most of Britain was ruled from Rome as the Province of Britannia. As pressures from outside the empire, and weaknesses and corruption from inside grew Rome abandoned Britain. The result was that the Romano-British (who would one day become the Welsh) were left to defend themselves from Picts and Irish and Germanic Raiders. The Anglo-Saxon Chronicle and other records suggest that after Rome officially told the former province of Britannia to look to its own defences in about 416 AD that the British invited in Germanic mercenaries to help defend Britain. Probably German tribes were already migrating to Britain in the Roman period as the Romans used Germans in their Legions but in 449 there is this entry. The British King Vortigern invited Hengest and Horsa to come to Britain. 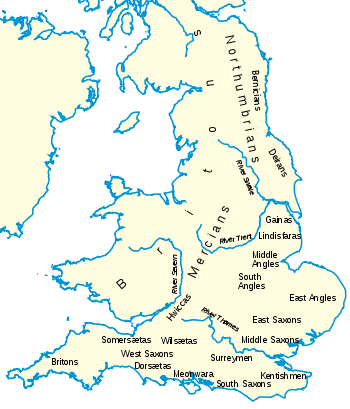 The Angles - from Denmark settled along the North and East - in Northumbria and East Anglia. The Saxons - from Northern Germany settled Essex, Sussex, Kent and other South Eastern parts. From about AD 600 onwards several of the Chroniclers of the time began to talk of overlords or Imperators who recalling the power of Roman Emperors exerted influence BEYOND their own borders. 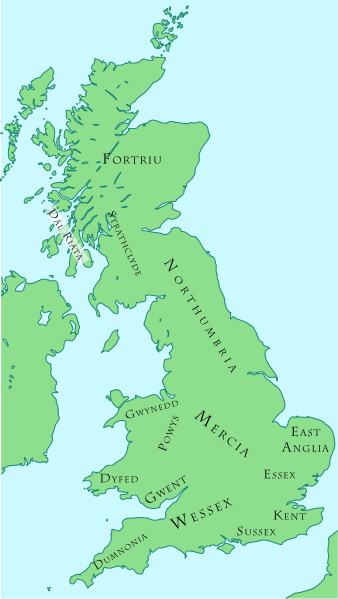 In the late sixth century the King of Kent was a prominent lord in the south; in the seventh century the rulers of Northumbria and Wessex were powerful; in the eighth century Mercia achieved hegemony over the other surviving kingdoms. These Imperators give us a hint of the struggle towards the possibility of a single King and a single Kingdom - England. But just as the move towards a unified England are going on the we enter the era of a great threat to England - the Vikings. From the late 8th century and in particular the 9th,10th and 11th Centuries the Vikings or Danes began raiding Britain. At first the Vikings plundered and killed but went away again. In time, however, they stayed and settled the east coast of Northumbria and East Anglia. They destroyed the Kingdoms of Northumbria, East Anglia, Essex and Mercia and almost overran Wessex. But a young king called Alfred defeated them at Edington, Wiltshire, in 878 and earned himself the name "The Great". He made a peace with the Vikings and saved England but the peace deal granted the VIkings a kingdom called Danelaw which included their possession of Jorvik (York) and so the Danes had gained a solid foothold in England. The Vikings would continue to be a threat right up to 1066 when they fought Harold at Stamford Bridge. Indeed a Viking King - Canute and his sons sat on the English throne in the 11th century and ruled over a unified England at last - Vikings and English as one people. This unified England carried on under the last Anglo Saxon Kings - Edward and Harold. Finally then we have one land - one England. Then came 1066. King Edward the Confessor made one major error. Having failed to produce an heir he made a mess of establishing the sucession. He led William of Normandy into a belief that he was the heir - a belief given weight when William obliged the obvious English candidate - the powerful Earl Harold - to swear alliegance to him. When Edward died and the Witan elected Harold as king the scene was set for the Norman Invasion. 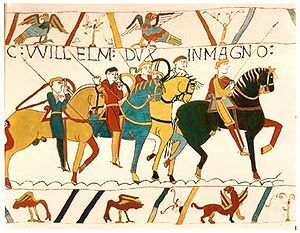 The Norman conquest of England began on 28 September 1066 with the invasion of England by William, Duke of Normandy, who became known as William the Conqueror after his victory at the Battle of Hastings on 14 October 1066, defeating the then king Harold II of England. Harold's army was badly depleted in the English victory at the Battle of Stamford Bridge in Northern England on 25 September 1066 over the army of King Harald III of Norway. By early 1071, William had secured control of most of England, although rebellions and resistance continued to approximately 1088. The Aftermath - did the Anglo-Saxons Survive? So we can conclude that the Anglo-Saxon period did not really end in 1066. If you are English or of English decent YOU ARE an Anglo-Saxon.